So many thousands of years have passed and so many scholars have written about the ancient gods and deities that it is difficult to decipher the being known as Hermes Trismegistus and separate fiction from fact. Unfortunately, conflicting views exist on whether Hermes Trismegistus was a man or a god. Frances A. Yates suggests those living in Renaissance times believed he was a man: “It was on excellent authority that the Renaissance accepted Hermes Trismegistus as a real person of great antiquity and as the author of the Hermetic writings.” A city known as Hermopolis that existed in Egypt in ancient times strengthens the claim. Other scholars conjecture that different individuals completed the Hermetic writings over several hundred years. Perhaps the most important piece of evidence to back up this claim is the Syrian philosopher Iamblichus crediting Hermes with writing over 20,000 books and an Egyptian priest named Manetho crediting him with writing more than 36,000 books. Both of these men lived around 250-300 BC. Iamblichus went on to state he had seen forty-two of these books, thirty-six of which contained “the whole of human knowledge”. Many scholars have long held Hermes Trismegistus to be the equivalent of the Egyptian god Thoth, which certainly suggests he was not a real person. Frans A. Janssen subscribes to this view, describing Hermes Trismegistus as a “fictitious author” in his essay Dutch Translations of the Corpus Hermeticum. Anecdotal evidence suggests that Hermes was a man elevated to deity status and even if Hermes Trismegistus did not write the texts attributed to him, it is likely that a priest of the Egyptian god Thoth did. Others, such as Stock, state that Hermes Trismegistus was actually the grandson of the Hellenistic god Hermes, the messenger of the gods. The word Trismegistus literally means “thrice-greatest” and some believe Hermes’ title may actually come from the Rosetta Stone. There are many theories on the acquisition of the name Trismegistus, but most academics believe Hermes acquired his name from the epithet used for the Egyptian god Thoth – “greatest and greatest god, great Hermes.” Another popular and widely accepted interpretation of the term “Thrice Great” comes from Hermes’ reputation as the greatest philosopher, king and priest in the entire world. The Emerald Tablet or Tabula Smaragdina is Hermes’ most famous legacy and his best known work among modern-day practitioners of alchemy. Many legends exist regarding the discovery of the Emerald Tablet, although the most popular seems to be the story of Alexander the Great unearthing the text in Hermes’ tomb. The original Emerald Tablet, however, is lost to time. The content of the Emerald Tablet is quite short and deals with the nature of magic and the creation of life and matter by one God. Philosophical in nature, the text is often ambiguous and requires abstract interpretation. Hermes may have also derived his moniker “Thrice Great” from the tablet, its twelfth entry stating: “Therefore am I called Hermes Trismegistus, possessing the three parts of the philosophy of the whole world.” It is difficult to identity the “three parts of the philosophy of the whole world”. It may have been in reference to the process of deifying a mortal. Others apply a more literal meaning, stating he was the greatest philosopher of various intellectual disciplines, such as natural science. Whereas the Emerald Tablet remains lost to modern civilization, the Corpus Hermeticum presents a different tale. The texts of the Corpus Hermeticumremained comparatively obscure until 1460, when Cosimo de Medici received them as a gift. He immediately commanded the texts be translated into Latin so he might read them for himself. Almost two hundred years later, in 1650, a man by the name of John Everard translated the texts into English. Much of the Corpus Hermeticum is theoretical in nature, but the teachings often clearly set out the nature of alchemy. Hermes’ writings also recorded accurate scientific observations, such as the polarity of objects and the principle of cause and effect. The repressive Inquisition had a terrible effect on uncovering the knowledge of Hermeticism, however a number of cathedrals – including the one in Sienna, Italy – bear depictions of Hermes Trismegistus. 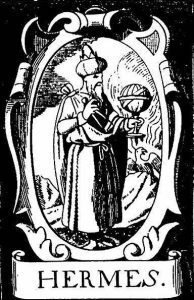 It is important to remember that Hermes Trismegistus (assuming he was not a god himself) was a monotheist and one of his disciples was actually reputed to have been the Biblical Moses. Some believe that Hermes even prophesied that a man from the “lower social classes” would lead the Jews to freedom. In the Corpus Hermeticum, there are accounts of the creation of mankind, although in this creation theory man is somewhat more power than in the Biblical version: he creates the animals of Earth after traveling through the “seven levels of reality” (keeping in mind that seven is a holy number) and becoming subject to the vagaries of fate. Hermes is perhaps alchemy’s most important ancient figure, and a patriarch of the art. Hermes Trismegistus was the god of mathematics, writing and scholars and the reason why alchemy is now often known as the “Hermetic Art”. Many believe he also designed the Hanging Gardens of Babylon, built several pyramids and even taught the great mathematician Pythagoras. The long correlation between alchemy and Hermes began two hundred years after the birth of Jesus Christ, when Gnostics interpreted the texts of Hermes Trismegistus literally and began consistently applying the teachings to their alchemical pursuits. Jean-Pierre Mahe believes there were Judaistic Gnostic communities who acted much like secret societies do today in addition to a more open system of Hermeticism in Egyptian lands prior to extensive Roman conquest. The knowledge moved to Arab lands in the following centuries, possibly due to the rise in power of the Roman Catholic Church, but found its way back into Europe via Cosimo de Medici during the Renaissance. With independent learning once more encouraged and buoyant, alchemists used the texts and alchemy eventually became known as the “Hermetic Art”. Despite the significance of the Hermetic texts to the study of ancient civilizations and the belief systems of ancient times, the study of alchemy quickly became the poor cousin of chemistry as the world entered the Industrial Revolution and the modern age. Alchemy concentrated first on the purification of the mind followed by self-knowledge, but chemistry skipped straight to the lesser, physical aspects of the art. Alchemy endured a long period where scholars disregarded and scoffed at it whenever the opportunity arose. Hermes Trismegistus was a figure of new age spiritualism, one to ignore and consider a myth like so many other ancient gods. That has changed. Even if Hermes Trismegistus did not write all of the texts attributed to him, the works that collectively make up the Hermetic writings were a bastion of learning in ancient times and allow us a fascinating insight into the progression of knowledge up to the present day. The University of Bristol School of Chemistry even features alchemy and Hermes Trismegistus on its website. Perhaps one day Hermes Trismegistus will be as well-known to the everyday person as Benjamin Franklin or Sir Isaac Newton … and rightly so. Gilbert, A., Hermetica Page, [Online]. Available at URL:http://www.adriangilbert.co.uk/docus/docus/books/hermetic.html (accessed 21 September, 2002). The Gnostic Society Library, The Corpus Hermeticum, [Online]. Available at URL: http://www.webcom.com/~gnosis/library/hermet.htm (accessed 15 September, 2002). ‘Great Theosophists – Alchemy and the Alchemists’ 1937, THEOSOPHY, vol. 25, no. 11, pp. 490-496. 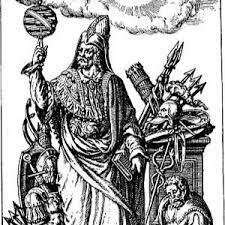 Hermes Trismegistus, Hermes Trismegistus and the Hermetic Writings, [Online]. Available at URL:http://students.roanoke.edu/groups/relg211/bennett/index.html (accessed 17 September, 2002). Hermes Trismegistus, [Online]. Available at URL:http://www.angelfire.com/ny5/satchmo13/Hermes.html (accessed 9 September, 2002). Hermes Trismegistus, [Online]. Available at URL:http://theosophy.org/tlodoes/teachers/HermesTrismegistus.htm (accessed 26 September, 2002). Hermeticism, [Online]. Available at URL:http://www.belirus.co.uk/mythology/Hermeticism.html (accessed 12 September, 2002). Janssen, F.A., Dutch Translations of the Corpus Hermeticum, [Online]. Available at URL: http://www.xs4all.nl/bph/dutch_ch.html (accessed 15 September, 2002). Shumaker, W., 1972, The Occult Sciences in the Renaissance: A Study in Intellectual Patterns, University of California Press. University of Bristol School of Chemistry, Spiritual Alchemy, [Online].Available at URL:http://www.chemsoc.org/exemplarchem/entries/2002/crabb/spirit.html (accessed online 27 September, 2002). Voice of Truth, Ancient Egyptian Wisdom, [Online]. Avaialble at URL:http://www.voiceoftruth.com/ancientwisdom.html (accessed 21 September, 2002).